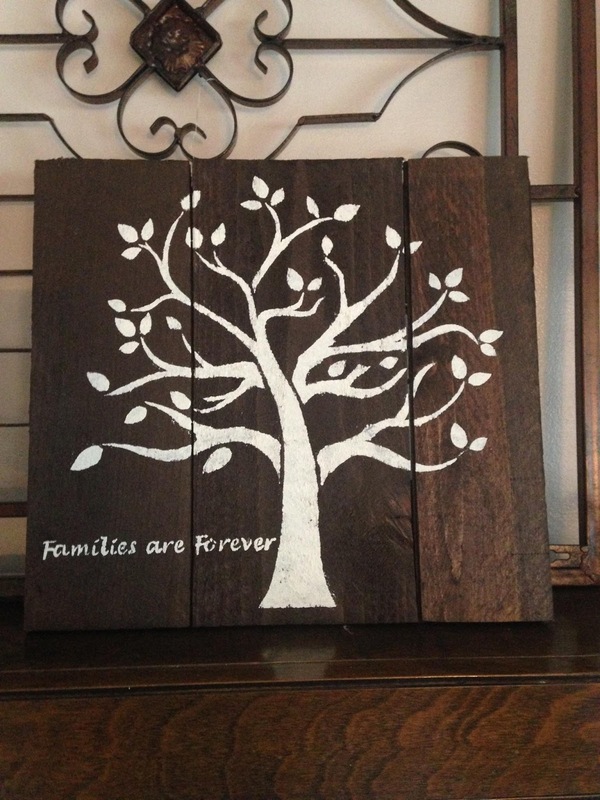 One of the things I wanted to do this year at MOPS was some sort of wood craft. I had taken inspiration from this piece I saw on Pinterest. I made an example like I always do for any craft. 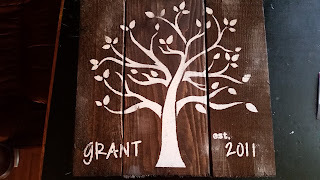 Once I did that I knew I wasn't going to be able to do a craft that was that big in size so I had to get creative especially since I have a budget to think about. The best thing is one of our friends had a few pallets that he didn't mind giving to me so all the wood ended up being free. Michael and I both cut the wood apart into 12 inch pieces and then we nailed them together so they were 12 X 12 squares. 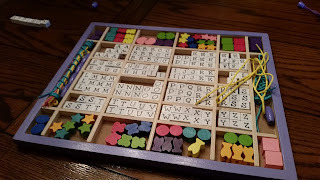 I stained all the squares with a dark stain I had on hand and then I used this cream colored craft paint that I got on clearance at Joann's for .99! The only thing that ended up costing money were the two stencils I bought and nails. 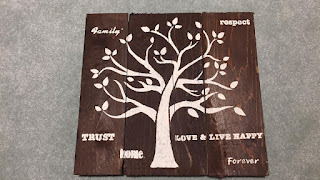 The tree was $3.99 from Scrapbook.com and the one that had the sayings was from Joann's. I think it was probably $5, but I'm sure I used a coupon. In all the entire craft cost around $20! Since this was a pretty in-depth craft we didn't actually do the craft at MOPS. Instead I did a demo on how to stencil and then a week after the demo the ladies that were interested in making their own piece came over to have a fun crafting day. This was the one I made at MOPS while I was doing the demo. I had already completely one prior to the meeting so I raffled off both of them during MOPS. My friend Amanda got to take this one home with her! If I'm remembering correctly there were 8 ladies that came to my house. 5 came in the morning and then the other 3 came in the afternoon. It was a full day of fun crafting! It was really neat to see the different designs that the ladies came up with. Each unique and each fit their personalities. 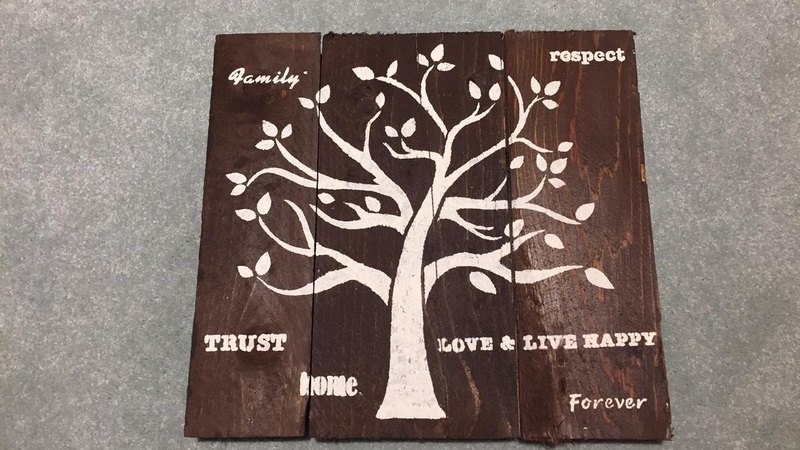 Corinne is all about nature right now so this saying was just perfect for her house. I love how she made the extra branches come in on the right side. Alicia made this one. The difference in style and preference was fun to see. Alicia wanted her tree to be more solid white, but Corinne wanted her tree to be a little on the lighter side with the paint so the brown would show through. Kara made this one...it was fun to see someone make it with the tree pointed the other direction. Melinda decided to do something different from everyone else. She actually put tape over the trunk on the bottom of the tree. She wanted her trunk to be shorter so she could fit her saying centered in the middle under the tree. It really turned out great! 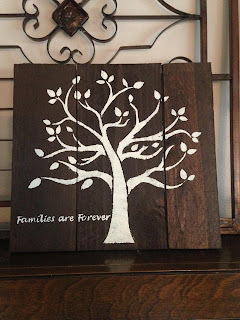 My MOPS Coordinator Laci made this for her family. 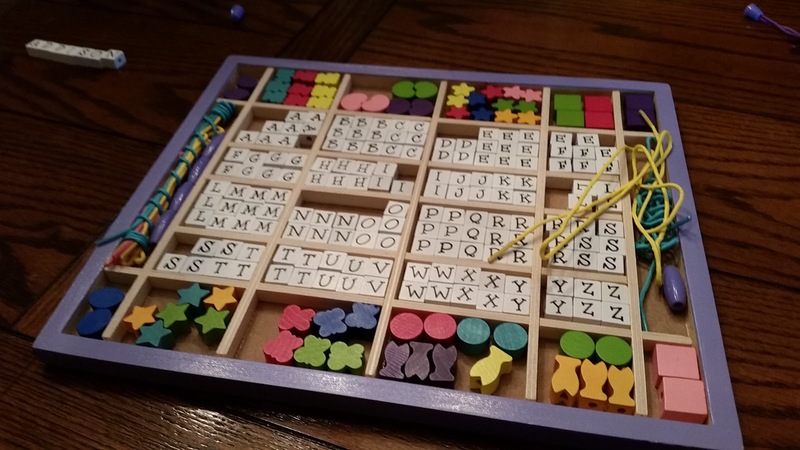 She was super precise with those letters and it took a while for her to complete it. It turned out so professional....love it! She also did her tree faces the other direction! Elaina made this one. I love how she chose a bunch of different sayings! I joined in the fun and made this one for my brother & sister-in-law. 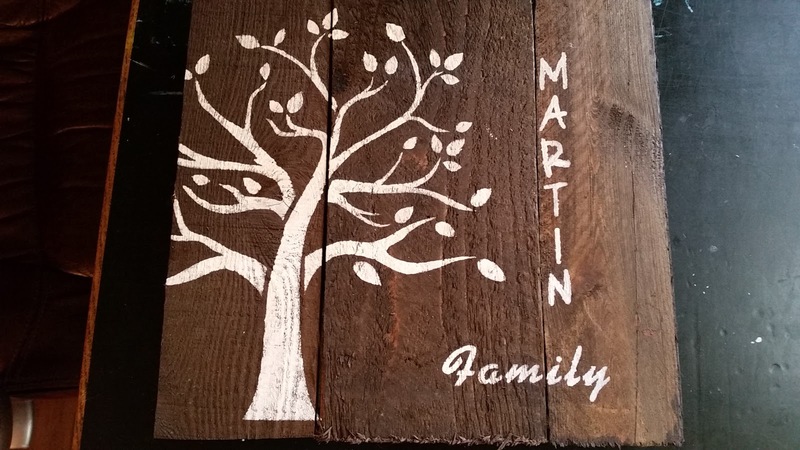 Their 5 year wedding anniversary was coming up and I thought it would make a fun gift. Stephie of course loved it! There were a couple other ladies that came, but I wasn't able to get pictures of theirs. They all turned out so wonderful and it was such a fun day! Unfortunately the very next day was when I went down hill health wise so I ended up not finishing my own for over two weeks. In the end I decided to not have the full tree in the picture. I really like how it's not centered. 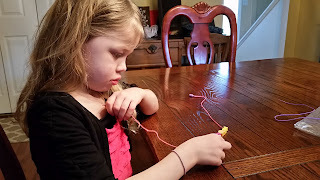 This was one of those crafts that I was actually dreading because it just seemed too overwhelming! I'm really glad that I took the time to give it a try and I figured out how to make it work and not spend a ton of money. 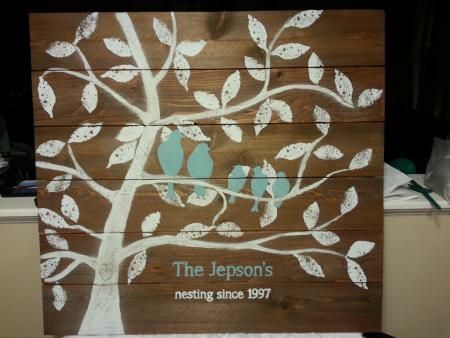 In fact I actually have another wood craft in mind for next years MOPS! 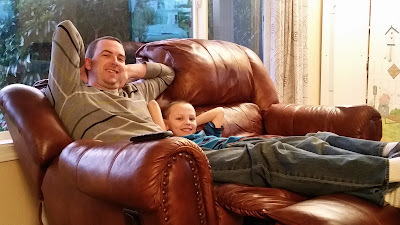 I took this picture of Owen and Michael over the weekend and thought it would be fun to list their similarities. I'm sure there are more, but this is what I came up with off the top of my head! On Saturday March 19th we went out as a family for the first time in weeks. 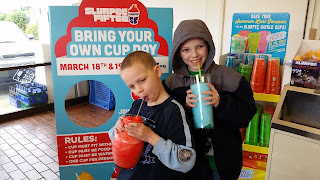 The neighbor kids had been telling Owen and Jack about this promotion going on at 7-11. 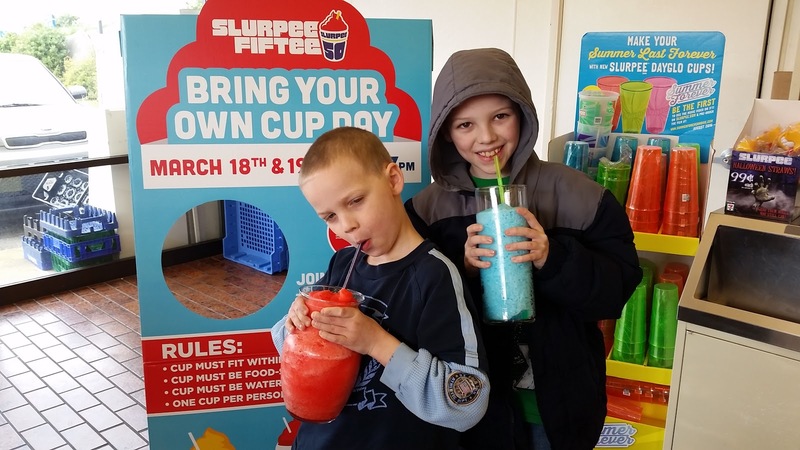 The boys misunderstood and thought it was free slurpee day, but we let them know that wasn't the case. It was just bring your own cup day! 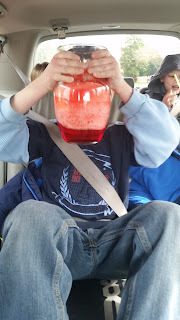 They got together the $1.50 they needed and we went through the cupboards looking for any sort of container that would work for a slurpee. According to the website it had to be clean, leakproof and no more than 10 inches in diameter. At first Owen was wanting to bring one of Michael's travel coffee mugs, but I explained the whole point of the promotion is to get a lot more quantity than you would normally for a just a little bit of money. We ended up finding some pretty big glass vases that we thought would work. At first I felt like a weirdo walking into 7-11 carrying glass vases, but then I saw the people that had just finished filling their containers with slurpees and they used a cleaned out gallon jug! When we left there was a lady and her daughter walking in with one of those big Rubbermaid cereal containers! 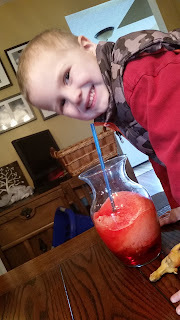 The boys were so happy to get to have all that slurpee all to themselves! The first 7-11 we stopped at didn't have any Coke slurpee ready...it was still freezing. So we drove up the road maybe a mile to the next 7-11 and they had some there. I used a glass pitcher that Michael and I got for our wedding. 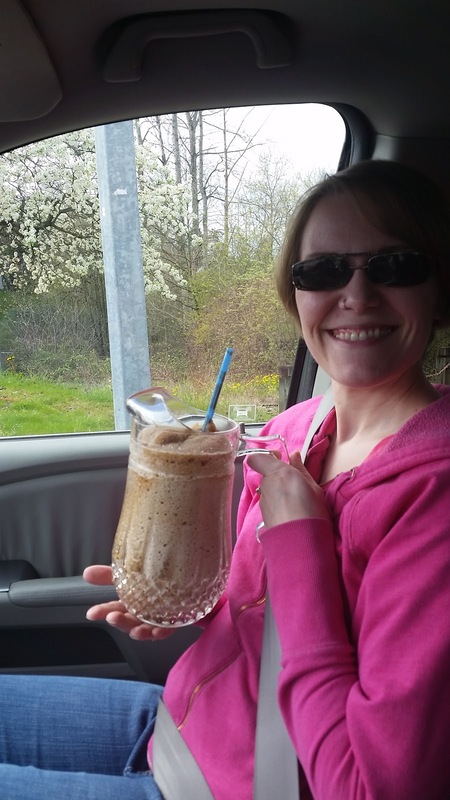 It held 44oz! Michael, Ella and I were sharing this one! At first I wasn't going to let the boys have theirs in the van, but then the slurpees started to melt pretty fast so I took a chance and lived on the wild side and thank goodness no one spilled their slurpee! Jackson was so sweet he was taking scoops of the slurpee with the straw and sharing with Zeke. Ella was the only one that had to wait to have any until we got home. She was very patient though! I was amazed that no one ended up getting a brain freeze. The only downside was that the cold really affected me and it made my cough worse. 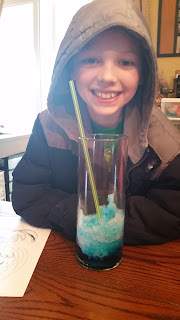 Owen drank almost all of his and then he started to experiment with adding other flavors. In the end I threw away about 2 inches of each of our slurpees. It was super fun though! 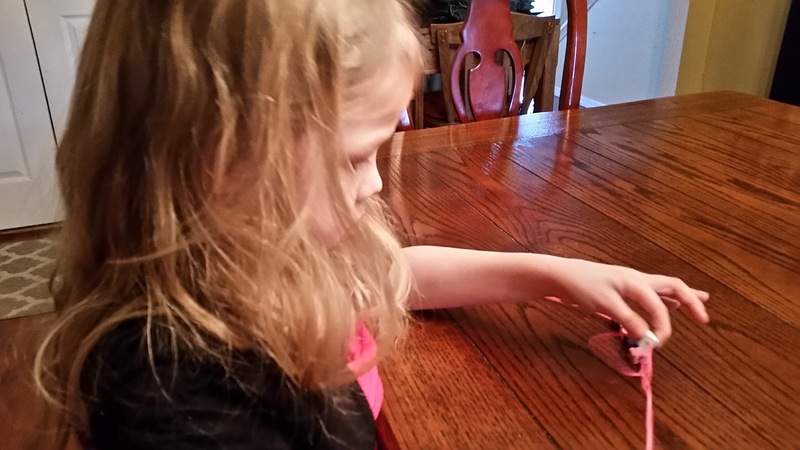 The other day Ella found my old pink cell phone case and she asked if she could have it. I've been meaning to put it on the FB Buy Nothing site, but figured why not let her have it. It of course was just the shell so it was empty inside. 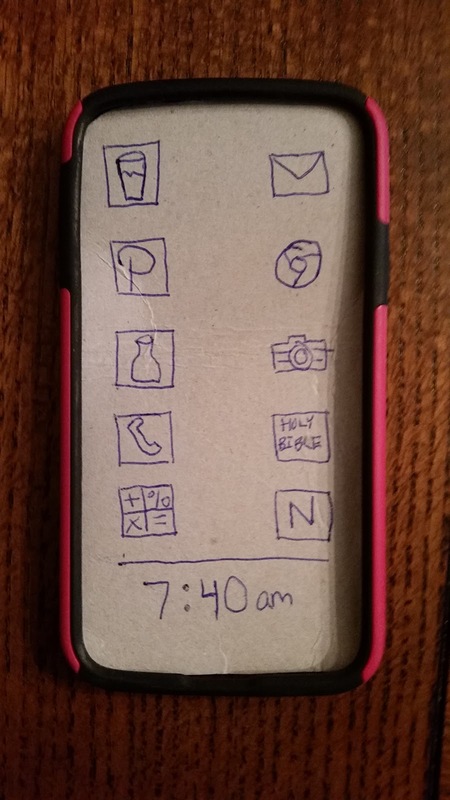 I had remembered recycling a pretty sturdy piece of cardboard earlier in the day so I salvaged that and cut it into the perfect shape to fit into the phone case. 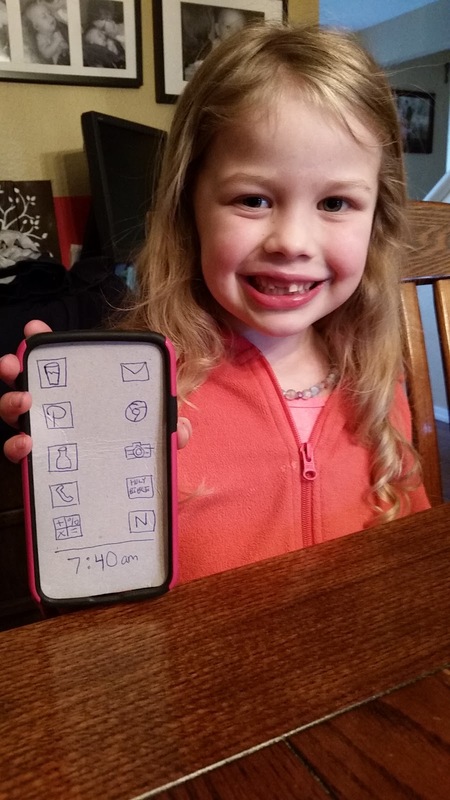 She loved it even though it was blank, but then asked if she wanted any apps. Of course she said yes....she wanted it to look just like mine. She now has 10 of the same apps I have. Starting at the upper left and going to the right....Water Your Body, Email, Pinterest, Chrome, Out Of Milk, Camera, Phone, Holy Bible, Calculator and Netflix. 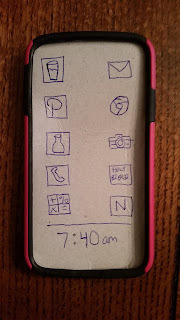 She also wanted the clock and she was very specific about it saying 7:40am. I guess all those mornings of me saying, "7:40 out the door" really stuck! She was so thrilled she carried it around with her all night and even slept with it on her nightstand like I do. The funniest thing that happened with it was she was "taking" pictures and Owen got a hold of her phone and was clicking on the screen while saying, "Delete, delete, delete!" He is such an older brother!!! Of course she was not happy with him AT ALL. Totally reminded me of when my brother would take my Cabbage Patch Kid and punch her over and over again. It would infuriate me and he would laugh his head off! Life would be too boring if we didn't have pesky a older brother and an annoying little sister though! While we were sick I had some pizza dough that needed to get used up. I knew that Michael probably wasn't going to eat much since he wasn't feeling good at all. 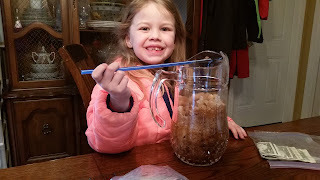 So instead of making big pizzas I thought it would be fun for each of the kids to make their own. You would have thought that would have done this with my kids before, but honestly it never crossed my mind. I helped the boys roll out their dough and then they spread the sauce on. Usually when I make pizza I use tomato sauce on two pizzas and then ranch dressing on two pizzas. I never end up using a whole can of tomato sauce. So I put it in the frig thinking I'll use it and I never do and it goes bad. The time before this when I made pizza I put the leftover sauce in little containers and then froze it. I have no idea why this had never crossed my mind before either! 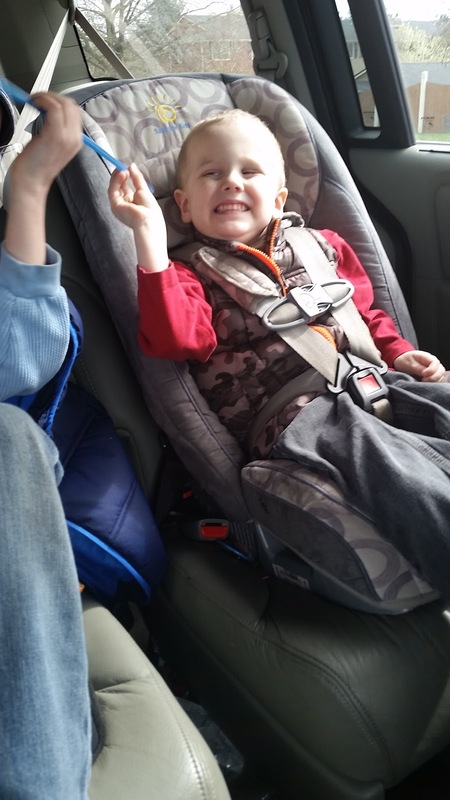 Then Owen got to put his cheese on. Jackson is pointing and saying..."That's Grandma Giest's rolling pin!" That's right....I love using it and thinking of her! When I make pizza I put the toppings on the sauce and then the cheese on. Owen doesn't like it that way so he put the cheese on, then the pepperoni and then a little bit more cheese. He was so happy he got to do it his way! Jack's turn! I realized after making Owen's pizza that we really didn't need to use so much dough...a little went a long way. It also made for a crispier crust which I really liked. When making big pizzas it's hard to get the crust super thin. I think I might have us make individual pizzas from now on. Owen checking on his pizza! I did most of the work for Zeke, but I saved putting the pepperoni on for him! Jack's turn to check on his pizza! It definitely takes longer making individual pizzas since I only have one baking stone. Enjoying the fruits of the their labor! Jackson being the healthy guy that he was ate the most pizza! Owen usually eats a ton of pizza, but he only ate 2 pieces. Zeke's pizza was the most perfect one in size. A cute little circle that made cute little wedges when cut. He loved it and he ate 3 pieces which for him is a lot! Ella was so sick I didn't even make her one in fact I think she was on the couch sleeping the whole we were making them. The day before Ella started puking for the second time we sat down and got to use her new beads she got from her birthday. The day before we did a test run and just made her a necklace, but now she wanted to make necklaces for her friends. 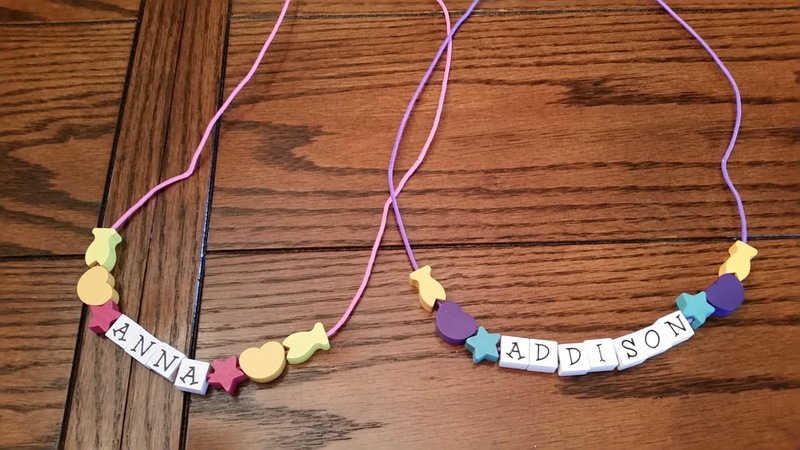 We also were planning on going to Anna & Addison's birthday party the upcoming Friday and I thought necklaces with their names on them would be great birthday presents. Also it would be fun since they were the ones that gave Ella the beads for her birthday. Of course we ended up being to sick to go to the party so we still haven't been able to give them to the girls, but we are supposed to see them on Easter. Here are all the beads. This is a Melissa & Doug set and it's great. It comes with the little plastic clasps that snap together. They have instructions on how to tie them on so they don't fall off which is what I've always struggled with when it comes to making bead necklaces. The only thing that I think is lacking with the set is a cover of some sort. Once you open them the beads are all exposed and it could get really messy. Thankfully I opened the plastic on the side and slipped it off so now when we are finished we can just slip it back on. Would be nice if they just made it come with a clear plastic top that snaps into place so you can still see the beads. What I did was picked out the beads that spelling one of the girls names and then Ella picked out the pretty beads that went on either side. They were all lined up just the way they needed to be threaded on. Once Ella put them all on I tied the other piece of the plastic clasp on and it was all finished! 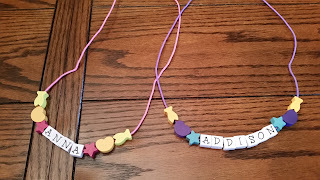 Here are Anna & Addison's necklaces. We made sure that they were different colors and I even looked on FB at a recent picture and saw that Anna was wearing pink and Addison was wearing purple so that's how we determined the color choices. 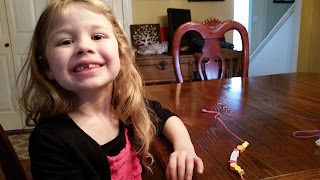 Ella also made two necklaces for girls at school....Kendra and Farrah! I think they turned out beautiful and it was fun getting to make these with her! 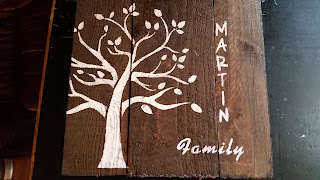 Thanks To My Woodworking Husband! A few Saturdays ago before Michael got sick he got a little fire under him and had to go spend his Christmas money from my parents. He ended up buying over $300 in tools at Harbor Freight tools. He was so cute he laid them all and took a picture and texted it to my Dad to show off his haul! Boys and their toys! After buying all those tools he really wanted to put them to use. So he started asking me about the benches that I was going to built later this year with my Dad. He started drawing out what they needed to look like to match the table and then he just said...."I'm going to go buy everything!" Off he went to Lowes and another hundred and some dollars later and he was home with all sorts of lumber and a few other tools. He first figured out how to make the legs match the table legs. They came out perfect. He also bought a new saw blade and that thing cuts like a warm knife through butter. The cuts are SO smooth! He also made the side rungs look like the underneath part of the table as well. Here's a look at both of the frames complete. He was working on them every night. The first night he finished the 4 sides and then the next night he finished the frames. I had gone to Costco and done our monthly shopping and Zeke was having fun messing around with one of the big boxes while Michael worked in the garage. Michael is trying to get the boys more interested in helping with these types of things. Owen is getting there, but Jackson didn't want to help. The coolest tool Michael got was this Kreg Jig. It's a tool that helps you make pocket holes for the screws to go in. Like professional furniture has. If you are going to build any type of furniture it's a definite must have and it wasn't even all that expensive. I think Michael said it was $39. It's also fool proof....you just set it to the width of the wood and clamp it down and it will only let the drill go in so far and then it stops. Super cool! I'm not sure if he was able to complete both tops in one night or not. But there they are both finished! He told me to take a picture of him laying down because he was so tired! Next came the stain...we got a color that matched the table perfectly! 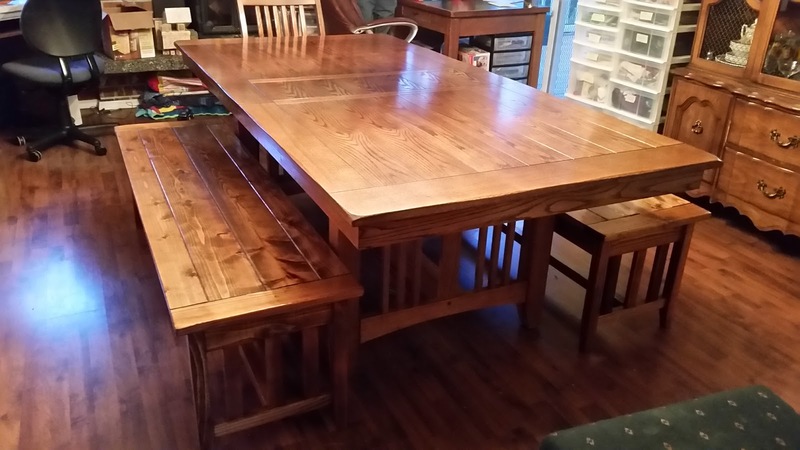 That had been my biggest concern when it came to purchasing this table so I was really happy that it worked out. Looking nice and dark! After that it was poly time. Two coats later and a couple more days to cure in the garage and then it was time to assemble them and bring them inside. Jackson wanted to take a picture of me sitting on the bench. Not quite in focus, but so nice of him to want to get a picture of me with my benches! Here a look at the supports and how they match so nicely! So to celebrate we had ice cream cones! I had a bunch of heavy cream and half and half that was going to expire so over the course of 2 days I made homemade chocolate ice cream, vanilla with chocolate caramel chunks and mini chocolate chip. I also got the kids ice cream cones which I never buy. I think I will buy them more though....first they are cheap and second they make it so the kids don't eat as much ice cream. Zeke is not so good with a cone though...he likes to let his melt into soup. No cone for you! Jackson is the only one of the kids that doesn't really like the benches so he is sitting at the end of the table in one of the chairs. Owen is enjoying the mint chocolate chip ice cream and I have to say that it was my favorite ice cream too! 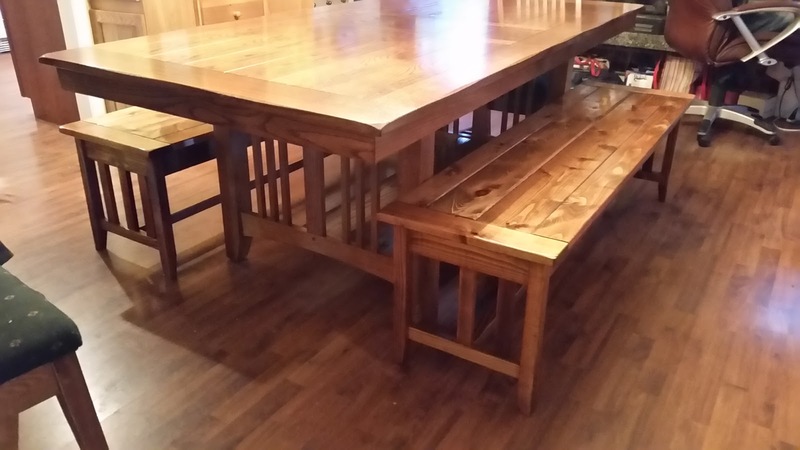 A couple more pictures of the table with the benches. They are just gorgeous! I'm so proud of Michael! He worked so hard and he has never really built anything like this before. He just amazes me! 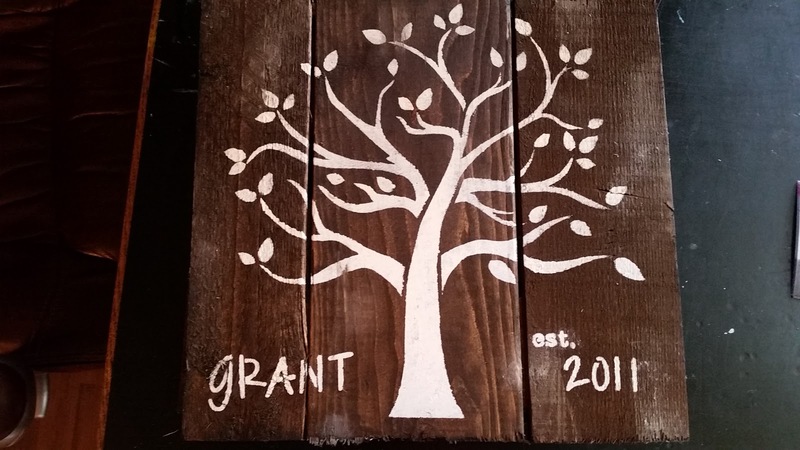 Now you might say...I thought you wanted to built them with your Dad....and the answer is yes I did truly want to do that, but I wasn't going to stop my husband from taking the reigns over. I think it was bugging him that the table project wasn't going to be done for months and months. Funny because that stuff would usually bother me, but it didn't. Also Michael built them WAY faster than I think my Dad and I could have built them. My Dad is very familiar with metal....he is a welder so that's his preference when it comes to building material. My parents didn't even know Michael was working on them until I texted them a picture of the finished benches. They were both thrilled. I think in a way my Dad was relieved. It was a big project and to start something like that right after he retired wouldn't have felt like much of a retirement now would it! My Mom did mention something about how he wants to weld us a new mailbox so maybe I'll have to get in on that! The sad thing about our benches is right after Michael brought them in was when all the sickness stuff really got going. We literally were so sick we were just eating in the living room and really eating is a relative term. It was like snacking throughout the day when we actually felt hungry which wasn't very often. It was over a week before we actually sat down at the table and had a family dinner! There are a few things that I still have to get used to. Like when I was doing the laundry the other day I went to go lay one of the kids shirts over the backs of one of the chairs and went...AHHH. There's no chair backs. I always lay each of the kids clothes on separate chair back so it's easier to take them up to put them away since they are all separated according to child. Well now there's only two chairs instead of 6! Jackson was in the dining room when I realized this and he being the not loving bench boy that he is said, "See the benches were not a good idea!" Of course you can imagine the look I gave him and then I promptly pulled out one of the benches and started laying the clothes on them instead. Goofball! Another thing is it's harder for me to get out during dinner time as quickly as I could before. Where I sit the quickest way for me to go to the kitchen is to go to my right, but to get out of the bench I have to swing my legs over the bench. So now I have to go to the left and it's just not as easy as before. But I think it's a blessing because I'm now asking the kids before dinner...."Do you need anything else because once I sit down I'm down?!?!" If they end up needing something it's Too Bad So Sad or you can get it yourself! I'm so so SO happy with my benches! They turned out amazing! Michael is already thinking up designs for end tables for our living room so I think he's got the builder bug! It will be fun to see what he comes up with! Dash Point State Park & The Long Sick Saga Story! There's Still Some Miles Left On Those Tires!